For some of the finest fishing in eastern Washington, join us in chase of some shiny Kokanee silver bullets. These land-locked sockeye provide plenty of action for the kids and more than enough challenge for the family! Enjoy the day on a beautiful area lake and bring home a haul of fresh kokanee for the BBQ or the smoker! Lake Chelan kokanee fishing will start as early as February and can run through the summer. With a 10 fish limit we aspire for limits of 20, 30, and 40 fresh kokanee in the cooler…which might require 100 bites….so there’s plenty of fast action to go around for sure! And be prepared for the occasional land-locked chinook! Lake Conconully and Palmer kokanee fishing will start with the general opener the end of April and can run through the summer. Don’t be fooled by the 5 fish limit, these are stout and tasty fish. Plan for a couple days and enjoy the lodging and dining in Conconully, Palmer, and the beauty of Okanogan County! COMING SOON! We’re making plans to start guiding Lake Roosevelt for their trophy size kokanee! 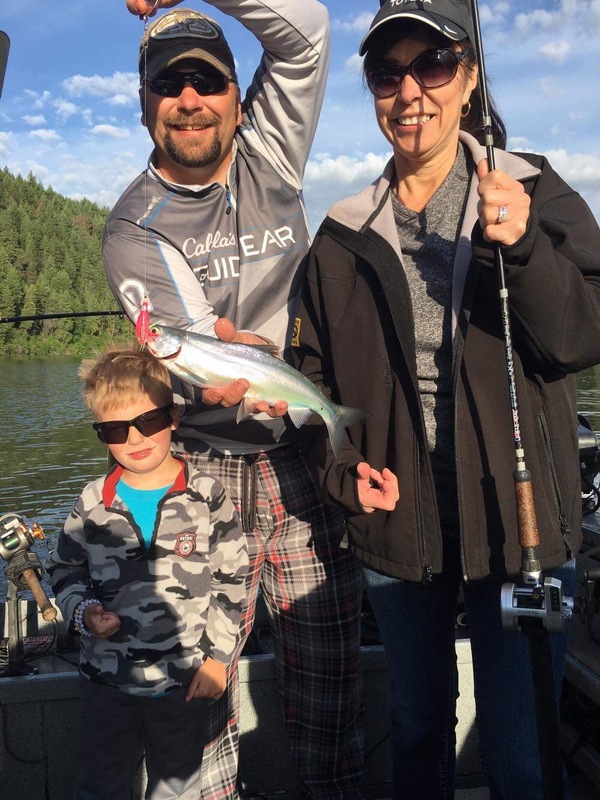 Guided kokanee fishing trips with Okanogan Valley Guide Service, one of north central Washington’s premier guide services, home of Super Dipping Sauce and Money Maker brand fishing products. With two experienced professional fishing guides, and two well equipped guide boats, we can accommodate larger groups too! Everything provided – rods, reels, and bait. You just need to bring your fishing license and camera to capture some great memories. RATES: 4 people $700 or $200/person, minimum of 2 people. Call or text 509-429-1714 today and reserve your seats! Deposit of half is required and if the trip is cancelled prior to 10 days, the deposit is forfeited.